Ben Chorley's header rescued a point for Leyton Orient against Rochdale. Dale had the better first-half chances and took the lead when Brian Barry-Murphy's cross was glanced into his own net by O's defender Terrell Forbes. The home side continued to put pressure on Orient and shots from Chris O'Grady and Alan Goodall forced goalkeeper Jamie Jones into action. But the O's levelled when Paul-Jose Mpoku's corner found Chorley, who nodded in from eight yards out. "I don't think it was the right decision for the game to go ahead and it should have been called off, probably at half-time, it was a farce. "That as a spectator going to a football match wasn't worth watching, I won't watch it again on the DVD, it was awful. "We've always advocated the type of football we want to play - you couldn't play on that pitch and the pitch has been sacrificed now for one 90 minutes." "The big picture before the game was whether it was going to go ahead or not. "Conditions were not conducive to good football, we have to say that because it wasn't easy. "To be fair both sides want to play football, they had the better of the first half and for sure I thought we edged it in the second." 90:00+3:15 The referee ends the match. 90:00+2:33 Corner taken by Gary Jones from the left by-line to the near post, Stephen Dawson manages to make a clearance. 90:00+1:22 Terrell Forbes gives away a free kick for an unfair challenge on Chris O'Grady. Gary Jones has an effort direct from the free kick, blocked by Paul-Jose M'Poku. 89:56 Alex Revell produces a cross. 86:54 The ball is crossed by Gary Jones. 86:35 Corner taken by Matt Done, clearance made by Ben Chorley. 86:18 Chris O'Grady takes a shot. Fantastic save by Jamie Jones. 85:53 Jean-Louis Akpa Akpro takes a shot. Save by Jamie Jones. 84:14 Free kick awarded for an unfair challenge on Matt Done by Ben Chorley. Free kick crossed left-footed by Alan Goodall from right wing, save made by Jamie Jones. 82:40 Liam Dickinson gives away a free kick for an unfair challenge on Jimmy Smith. Free kick taken by Ben Chorley. 81:40 A cross is delivered by Charlie Daniels, clearance by Alan Goodall. 81:17 Inswinging corner taken from the right by-line by Charlie Daniels, save made by Josh Lillis. 81:05 Dean Cox sends in a cross, blocked by Joe Widdowson. 79:08 Corner taken left-footed by Alan Goodall, clearance by Stephen Dawson. 78:44 The ball is swung over by Matt Done, clearance by Ben Chorley. 77:44 Corner from the right by-line taken by Charlie Daniels, The ball is sent over by Stephen Dawson. 76:50 The ball is sent over by Dean Cox, Craig Dawson makes a clearance. 76:45 Paul-Jose M'Poku crosses the ball. 75:58 Alan Goodall produces a cross. 75:20 Outswinging corner taken from the left by-line by Joe Widdowson. 74:57 Free kick awarded for an unfair challenge on Jean-Louis Akpa Akpro by Andrew Whing. Gary Jones restarts play with the free kick. 74:30 Paul-Jose M'Poku is ruled offside. Josh Lillis takes the free kick. 73:45 Substitution (Rochdale) makes a substitution, with Jean-Louis Akpa Akpro coming on for Brian Barry-Murphy. 73:18 Paul-Jose M'Poku delivers the ball. 72:25 Substitution Harry Kane replaces Scott McGleish. 71:49 Shot from outside the box by Gary Jones goes wide right of the target. 69:35 Paul-Jose M'Poku sends in a cross. 69:09 The ball is sent over by Dean Cox. 68:35 Liam Dickinson challenges Stephen Dawson unfairly and gives away a free kick. Jamie Jones takes the indirect free kick. 66:21 Jason Kennedy takes a shot. Jamie Jones makes a comfortable save. 65:21 Dean Cox sends in a cross, Alex Revell has an effort at goal from deep inside the area missing to the right of the target. 64:39 Scott McGleish fouled by Joe Widdowson, the ref awards a free kick. Dean Cox takes the indirect free kick. 63:04 Foul by Jimmy Smith on Alan Goodall, free kick awarded. Alan Goodall restarts play with the free kick. 62:48 The ball is swung over by Liam Dickinson, Stephen Dawson manages to make a clearance. 59:49 Inswinging corner taken by Dean Cox, the assist for the goal came from Dean Cox. 59:49 GOAL - Ben Chorley:Rochdale 1 - 1 Leyton Orient Ben Chorley finds the net with a headed goal from close in. Rochdale 1-1 Leyton Orient. 58:17 Stephen Dawson restarts play with the free kick, Ben Chorley takes a shot. Blocked by Craig Dawson. 56:51 Effort on goal by Liam Dickinson from outside the box goes harmlessly over the bar. 55:31 Chris O'Grady takes a shot. Jamie Jones makes a save. 54:35 Long range shot from Scott McGleish misses to the left of the goal. 53:08 Paul-Jose M'Poku takes a shot. Save by Josh Lillis. 51:54 Charlie Daniels crosses the ball, clearance by Craig Dawson. 51:44 A cross is delivered by Paul-Jose M'Poku, Craig Dawson manages to make a clearance. 50:50 Liam Dickinson takes a shot. Jamie Jones makes a save. 49:47 Foul by Brian Barry-Murphy on Stephen Dawson, free kick awarded. Dean Cox takes the indirect free kick. 49:20 Liam Dickinson sends in a cross, clearance made by Ben Chorley. 47:40 Paul-Jose M'Poku crosses the ball. 46:43 Free kick awarded for a foul by Alex Revell on Craig Dawson. Josh Lillis takes the free kick. 46:18 Free kick awarded for a foul by Jason Kennedy on Stephen Dawson. Indirect free kick taken by Jamie Jones. 45:01 Substitution Paul-Jose M'Poku is brought on as a substitute for Matthew Spring. 45:00+1:19 The match has reached half-time. 45:00+0:51 Corner taken right-footed by Charlie Daniels from the right by-line to the near post, clearance made by Alan Goodall. 45:00+0:42 Andrew Whing sends in a cross. 43:48 The ball is delivered by Brian Barry-Murphy, Jamie Jones makes a save. 43:12 Corner taken by Brian Barry-Murphy from the left by-line, clearance made by Alex Revell. 43:12 Substitution Nicky Adams goes off and Matt Done comes on. 42:40 Ben Chorley gives away a free kick for an unfair challenge on Liam Dickinson. Brian Barry-Murphy restarts play with the free kick. 42:01 Chris O'Grady has an effort at goal from the edge of the box that misses to the right of the target. 39:06 Jason Kennedy produces a left-footed shot from just outside the box that misses to the right of the goal. 38:29 Corner from the right by-line taken by Brian Barry-Murphy, Craig Dawson takes a shot. Clearance by Stephen Dawson. 38:09 Alan Goodall takes a shot. Save by Jamie Jones. 37:30 Chris O'Grady takes a shot. Save made by Jamie Jones. 36:49 Free kick awarded for a foul by Matthew Spring on Liam Dickinson. Brian Barry-Murphy delivers the ball from the free kick left-footed from right wing, clearance made by Ben Chorley. 36:49 Booking Matthew Spring is shown a yellow card. 35:29 A cross is delivered by Alan Goodall. 34:01 Brian Barry-Murphy provided the assist for the goal. 34:01 GOAL - Terrell Forbes:Rochdale 1 - 0 Leyton Orient Own goal by Terrell Forbes. 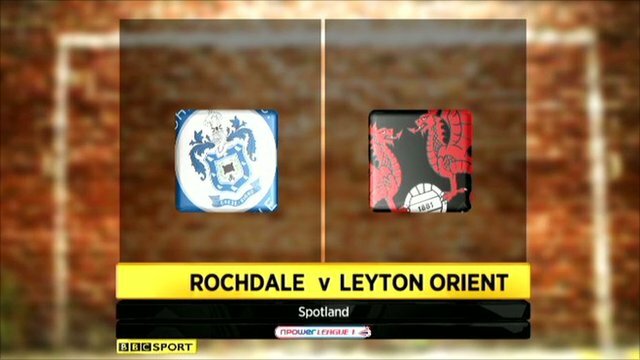 Rochdale 1-0 Leyton Orient. 33:13 Corner taken by Brian Barry-Murphy from the right by-line, clearance by Terrell Forbes. 32:39 Nicky Adams produces a cross, save made by Jamie Jones. 30:46 Inswinging corner taken right-footed by Nicky Adams. 29:07 Shot from long range by Stephen Dawson goes wide of the left-hand upright. 28:40 Foul by Marcus Holness on Scott McGleish, free kick awarded. Matthew Spring takes the indirect free kick. 28:12 Shot from outside the penalty box by Chris O'Grady goes wide right of the goal. 26:59 Liam Dickinson produces a cross, save by Jamie Jones. 26:36 Liam Dickinson produces a cross, Jamie Jones makes a save. 24:07 Nicky Adams takes a shot. Save made by Jamie Jones. 22:36 Chris O'Grady challenges Andrew Whing unfairly and gives away a free kick. Charlie Daniels produces a cross, Terrell Forbes takes a shot. Blocked by Marcus Holness. 21:02 Alan Goodall takes a shot from a long way out which goes wide of the right-hand upright. 20:45 Corner taken left-footed by Brian Barry-Murphy, Jimmy Smith manages to make a clearance. 20:27 The ball is sent over by Marcus Holness, Craig Dawson takes a shot. Blocked by Andrew Whing. 20:03 Inswinging corner taken by Brian Barry-Murphy from the right by-line, clearance made by Matthew Spring. 19:46 Nicky Adams takes a shot. Blocked by Ben Chorley. 16:43 Corner from the right by-line taken by Brian Barry-Murphy, Craig Dawson concedes a free kick for a foul on Alex Revell. Jamie Jones takes the indirect free kick. 15:47 Chris O'Grady produces a left-footed shot from the edge of the box and misses to the left of the target. 14:59 Jimmy Smith challenges Jason Kennedy unfairly and gives away a free kick. Alan Goodall takes the free kick. Correction - 14:12 Substitution Josh Thompson goes off and Alan Goodall comes on. 14:12 Substitution (Rochdale) makes a substitution, with Alan Goodall coming on for Josh Thompson. 12:07 Corner taken by Brian Barry-Murphy. 11:59 The ball is sent over by Gary Jones, Matthew Spring gets a block in. 10:41 Joe Widdowson sends in a cross, clearance made by Ben Chorley. 8:16 Free kick awarded for a foul by Nicky Adams on Charlie Daniels. Dean Cox sends in a cross, Scott McGleish has a headed effort at goal from close range which goes wide of the left-hand post. 7:16 The ball is swung over by Dean Cox, clearance by Marcus Holness. 6:31 Foul by Joe Widdowson on Scott McGleish, free kick awarded. Andrew Whing takes the free kick. 2:56 Matthew Spring has a shot on goal from outside the area which misses right.